Conrad Moffat Black, Baron Black of Crossharbour, KCSG (born 25 August 1944) is a Canadian-born British former newspaper publisher, author, and convicted felon. In 2007, Black was convicted on four counts of fraud in U.S. District Court in Chicago. While two of the criminal fraud charges were dropped on appeal, a conviction for felony fraud and obstruction of justice were upheld in 2010 and he was re-sentenced to 42 months in prison and a fine of $125,000. Black controlled Hollinger International, once the world's third-largest English-language newspaper empire, which published The Daily Telegraph (UK), Chicago Sun-Times (U.S.), The Jerusalem Post (Israel), National Post (Canada), most of the leading newspapers in Australia and Canada and hundreds of community newspapers in North America, before controversy erupted over the sale of some of the company's assets. Black was born in Montreal, Quebec, to a well-to-do family originally from Winnipeg, Manitoba. His father, George Montegu Black, Jr., a Chartered Accountant, became the president of Canadian Breweries Limited, an international brewing conglomerate that had earlier absorbed Winnipeg Breweries. Conrad Black's mother was the former Jean Elizabeth Riley, a daughter of Conrad Stephenson Riley, whose father founded The Great-West Life Assurance Company, and a great-granddaughter of an early co-owner of The Daily Telegraph. His father was a shareholder in The Daily Telegraph. Biographer George Toombs said of Black's motivations: "He was born into a very large family of athletic, handsome people. He wasn't particularly athletic or handsome like they were, so he developed a different skill – wordplay, which he practiced a lot with his father." Black has written that his father was "cultured [and] humorous" and that his mother was a "natural, convivial, and altogether virtuous person." Of his older brother George Montegu Black III (Monte), Black has written that he was "one of the greatest natural athletes I have known", and that though "generally more sociable than I was, he was never a cad or even inconstant, or ever an ungenerous friend or less than a gentleman." The Black family maintains a family plot at Mt. Pleasant Cemetery in Toronto where Black's parents and brother are buried along with his good friend and his wife's former husband, journalist, poet and broadcaster, George Jonas. Black was first educated at Upper Canada College (UCC), during which time, at age eight, he invested his life savings of $60 in one share of General Motors. Six years later, he was expelled from UCC for selling stolen exam papers. He then attended Trinity College School in Port Hope, where he lasted less than a year, being expelled for insubordinate behaviour. He did successfully complete the year as an extramural student. Black went on to a small, now defunct, private school in Toronto called Thornton Hall, continuing on to post-secondary education at Carleton University (History, 1965). He attended Toronto's Osgoode Hall Law School of York University, but his studies ended after he failed his first year exams. He completed a law degree at Université Laval (Law, 1970), and in 1973 completed a Master of Arts degree in History at McGill University. historically significant letters from Cardinal Jean-Marie-Rodrigue Villeneuve and Paul-Émile Léger, Governor General Field Marshal Alexander, Lord Beaverbrook, Canadian and French Prime Ministers and Eminent Canadian and American finance ministers side-by-side with hand-written, ungrammatical requests for jobs with the Quebec Liquor Board, unpaid bills, the returns of his ministers who were cheating on their taxes, a number of scribbled notes for Assembly speeches, tidbits of political espionage, compromising photographs, [and] a ledger listing the political contributions of every tavern-keeper in the province. Black subsequently had the principal items from the papers copied and microfilmed, and he donated copies to McGill, York, and Windsor universities. I have been persecuted and Barbara was under no obligation to share fully in the life-enhancing and undoubtedly character-building experience of sharing that fate with me completely. But she has, and no one can know, and it is beyond my power adequately to express here, what her constancy has meant to me. For more than four years before I was sent to prison, she toiled with me against the heavy odds generated by the legal and media onslaught. She endured an avalanche of abuse directed at her (although she wasn't accused of anything) as extravagant, flakey, apt to bolt, domineering, and what Kafka called "nameless crimes". For the next 29 months, she led a lonely life in Florida, in a climate that aggravated her medical problems. And once or twice every week, she got up at 3 a.m. to drive over four hours to see me. "My family", Black wrote in 2009, "was divided between atheism and agnosticism, and I followed rather unthinkingly and inactively in those paths into my twenties." By his early thirties he "no longer had any confidence in the non-existence of God." Thereafter, he "approached Rome at a snail's pace," and began to study the writings of Roman Catholic thinkers such as St. Augustine, Thomas Aquinas, Cardinal Newman, and Jacques Maritain. Having accepted the possibility of miracles and thus of the Resurrection of Christ, Black was received into the Roman Catholic Church on 18 June 1986 by Cardinal Gerald Emmett Carter, Archbishop of Toronto, at the Cardinal's residence. He had a dispensation to receive the sacraments of the Roman Catholic Church, from Cardinals Léger and Carter, starting in 1974. In the 25 years I knew him, his judgment and personality were always sober but never solemn; and never, not at his most beleaguered and not on the verge of death, did he show a trace of despair. He was intellectual but practical, spiritual but not sanctimonious or utopian, proud but never arrogant. He must have had faults, but I never detected any. He was a great man, yet the salt of the earth. In 2001, Black was invested as a Knight Commander of the Order of St. Gregory the Great, a Papal order of chivalry awarded by Pope John Paul II and delivered by Cardinals Carter and Aloysius Ambrozic. He has written that his faith helped him endure his imprisonment in the United States. Black is also a major shareholder in The Catholic Herald, and was the vice-president of Léger's charity from 1972 to 1990. Black became involved in a number of businesses, mainly publishing newspapers, starting when he was still in university. In 1966, Black bought his first newspaper, the Eastern Townships Advertiser in Quebec. Following the foundation as an investment vehicle of the Ravelston Corporation by the Black family in 1969, Black, together with friends David Radler and Peter G. White, purchased and operated the Sherbrooke Record, the small English language daily in Sherbrooke, Quebec. In 1971, the three formed Sterling Newspapers Limited, a holding company that acquired several other small Canadian regional daily and weekly newspapers, including the Prince Rupert Daily News and the Summerside, Prince Edward Island, Journal-Pioneer. George Black died in June 1976, ten days after his wife, leaving Conrad Black and his older brother, Montegu, a 22.4% stake in Ravelston Corporation, which by then owned 61% voting control of Argus Corporation, an influential holding company in Canada. Argus controlled large stakes in five Canadian corporations: Hollinger Mines, Standard Broadcasting, Dominion Stores, Domtar and Massey-Ferguson. Hollinger controlled Labrador Mining and Exploration and had a large stake in Noranda Mines. Black succeeded his father as a director of Dominion Stores and Standard Broadcasting, owner of radio stations CFRB (Toronto), CJAD (Montreal) and television station CJOH (Ottawa). Conrad Black became a director of the Canadian Imperial Bank of Commerce in 1977. Through his father's position at Canadian Breweries, and his status as a co-founder of Ravelston, Black gained early association with two of Canada's most prominent businessmen: John A. "Bud" McDougald and E. P. Taylor, the first two presidents of Argus. Following McDougald's death in 1978, Black paid $18 million to McDougald's widow and her sister for control of Ravelston and thereby, control of Toronto-based Argus. Interviews with the two sisters in their retirement homes in Florida were aired 21 September 1980 in the episode of the CBC's The Canadian Establishment, entitled "Ten Toronto Street". This episode covered the period during which Conrad Black became president of Argus Corporation following the death of McDougald. Black's new associate, Nelson M. Davis became chairman. Patrick Watson, the host and narrator of series interviewed the two widows in their Florida retirement homes. Black recorded that the widows "understood and approved every letter of every word of the agreement". Other observers admired Black for marshaling enough investor support to win control without committing a large block of personal assets. He brought in new partners to replace Mrs. McDougal and her sister Mrs. W. Eric Philips. Some of the Argus assets were already troubled, and others did not fit Black's long-term vision. Black resigned as Chairman of Massey Ferguson company on 23 May 1980, after which Argus donated its shares to the employees pension funds (both salaried and union). Hollinger Mines was then turned into a holding company that initially focused on resource-based businesses. In 1981 Norcen Energy, one of his companies, acquired a minority position in Ohio-based Hanna Mining Co. In a filing with the U.S. Securities and Exchange Commission (SEC), a disclosure was made to the effect that Norcen took "an investment position" in Hanna. The filing did not include a disclosure that Norcen's board planned to seek majority control. Black subsequently was charged by the SEC with filing misleading public statements. These charges were later withdrawn. In 1984, the Dominion Stores Board of which Montegu Black was the chairman, with the prior consent of the Ontario Pension Commission, withdrew over $56 million from the Dominion workers' pension plan surplus which the management had generated. The company said it considered the surplus the rightful property of the employer (Dominion Stores Ltd.), as the shareholders would have to pay for any shortfall if the assets had been less successfully invested. The Dominion employees' union the United Food and Commercial Workers protested, a public outcry ensued, and the case went to court. The Supreme Court of Ontario ruled against the company, and ordered the company to return the money to the pension fund, claiming that though the most recent language in the plan suggested the employer had ownership of the surplus, the original intention was to keep the surplus in the plan to increase members' benefits. Eventually, the pension dispute was settled in equal shares between the shareholders and the plan members. Over time, Black focused formerly diverse activities of his companies on newspaper publishing. Argus Corporation, was one of Canada's most important conglomerates, though apart from Standard Broadcasting, it had less than 25% of the stock of the companies in which it was invested, and four fifths of its own stock did not vote. Black had negotiated the acquisition of that stock from Power Corporation chairman Paul G. Desmarais in 1979 to become, as put it a 'real proprietor'. Black supervised the divesting of interests in manufacturing, retailing, broadcasting and ultimately oil, gas and mining. Canadian writer John Ralston Saul argued in 2008, "Lord Black was never a real 'capitalist' because he never created wealth, only dismantled wealth. His career has been largely about stripping corporations. Destroying them." Journalist and writer George Jonas, the former husband of Black's wife, Barbara Amiel, contends that Hollinger made its "investors... billions [of dollars]". Black bought Quebec City's Le Soleil, Le Droit of Ottawa, and Le Quotidien of Chicoutimi from Jacques G. Francoeur. In 1986, Andrew Knight, then editor of The Economist, advised Black an investment could be made in the ailing Telegraph Group (London, U.K.), and Black was able to gain control of the Group for £30 million. By this investment, Black made his first entry into British press ownership. Five years later, he bought The Jerusalem Post, and by 1990, his companies ran over 400 newspaper titles in North America, the majority of them small community papers. For a time from this date he headed the third-largest newspaper group in the Western World. Control of Australia's leading newspapers, the Sydney Morning Herald, Melbourne Age, and Australian Financial Review, albeit in a minority stockholding, was acquired in 1992. Initially in association with Sydney billionaire Kerry Packer and future Prime Minister Malcolm Turnbull. In 1994 Black and Radler bought Chicago's second newspaper, the Sun-Times. Hollinger had bought a 23% stake in the Southam newspaper chain in 1992 from TORSTAR, publisher of the Toronto Star. Black and Radler acquired the Chicago Sun-Times in 1994. Hollinger International shares were listed on New York Stock Exchange in 1996, at which time the company boosted its stake in Southam to a control position. Becoming a public company trading in the U.S. has been called "a fateful move, exposing Black's empire to America's more rigorous regulatory regime and its more aggressive institutional shareholders." Under Black, Hollinger launched the National Post in Toronto in 1998. This newspaper was sold throughout the country in direct competition with the Globe and Mail. From 1999 to 2000 Hollinger International sold several newspapers in five deals worth a total of CDA $3 billion, a total that included millions of dollars in "non-compete agreements" for Hollinger insiders. Institutional investor Tweedy, Browne opposed the payment of non-compete fees to Hollinger Management in connection with the sales and requested a special committee look into the compensation of management the day before the annual meeting in May 2003. Black agreed citing such fees were standard procedure in the newspaper industry, had been requested by buyers and had been properly disclosed. The special committee and its counsel, former Chairman of the SEC Richard Breeden, discovered that David Radler had misled the Hollinger directors, including Black about the extent of his own participation in some of the related party transactions to sell otherwise unclaimed community newspapers in the US and also that two of the smaller transactions involving non-compete payments had not been signed by the vendors. Breeden involved the US Attorney in Chicago, and Radler, after about 18 months, would promise to plead guilty to one count of fraud and to provide evidence against Black and others in exchange for a light sentence in Canada. Black made an agreement with Breeden, shortly after the unsigned status of the two non-compete agreements came to light, by which he would remain as Chairman, but temporarily vacate the position of Chief Executive, pending verification that he, Black, had known nothing of these problems, which were handled by the company's counsel, and occurred in Radler's American Publishing division. Black and Breeden were in negotiations, sponsored by Henry A. Kissinger, who was a Director of Hollinger, when the special committee, without warning, sued Black and others civilly. Black counter-sued, and included a libel suit in Canada. The libel settlement was by far the largest in Canadian history. The Hollinger group of companies was effectively dismantled as a result of the cascade of criminal and civil lawsuits that followed, in relation to sales of papers and intellectual property to third parties, most alleging misrepresentation and some alleging false or deliberately misleading accounts having been presented. The costs incurred by Hollinger International through the investigation of Black and his associates climbed to US$200 million. Black claims a significant portion of the sums paid by Hollinger International went to Richard Breeden. Black himself incurred high legal fees. Black resigned from the board of Hollinger in 2005, many of Hollinger International's assets ended up being sold at prices significantly lower than those contemplated by incomplete talks while Black was with the company. By the early 2000s, it was clear that Black had accurately anticipated the decline in profitability of print media assets and sought to divest those types of assets held by Hollinger before their value was irrevocably diminished. The criminal sanctions on Black not overturned were for removing 13 boxes of paper from his office a few days before he had to move offices, and under the gaze of security cameras he has installed, and for receiving US$285,000 as a non-compete payment that was approved by the independent director and publicly disclosed, but where the company secretary had neglected, in what the trial judge considered to be a clerical oversight, to have signed by the parties. Black co-hosted a weekly talk show, The Zoomer, which premiered 7 October 2013 on VisionTV in Canada, He did this for two years, and interviewed Donald Trump, Nigel Farage, Boris Johnson, and Justin Trudeau who went on respectively to be President of the United States, leader of UKIP, British Foreign Secretary, and Prime Minister of Canada. From January 2015 through 2016, Black hosted Conversations with Conrad, a series on VisionTV in which Black conducted long-form one-on-one interviews with notable figures such as apart those mentioned above Margaret Atwood, Brian Mulroney, Rick Mercer, Barry Humphries and Michael Coren. Born to a wealthy family, Black acquired the family home and 7 acres (2.8 ha) of land in Toronto's exclusive Bridle Path neighbourhood after his parents' deaths in 1976. Black and first wife Joanna Hishon maintained homes in Palm Beach, Toronto and London. After he married Barbara Amiel, he acquired a luxury Park Avenue apartment in New York. When the latter was sold in 2005, the U.S. Department of Justice seized net proceeds of $8.5 million, pending resolution of court actions. His London townhouse in Kensington sold in 2005 for about US$25 million. His Palm Beach mansion was listed for sale in 2004 at $36 million. In late April 2011 this Florida property was also sold by Black for approximately $30 million (USD). The Black family estate was sold in March 2016, for a reported price of CAD$16.5 million, but on a sale-lease-back of up to nine years, with an option to buy back, and the Blacks continue to live there. Black has disclosed his intention to remain and perhaps reacquire. He has returned to the UK part-time. According to biographer Tom Bower, "They flaunted their wealth." Black's critics suggested that it was Black's second wife, Amiel, who pushed him towards a life of opulence. Black has always denied that he spent more than his income and position justified. He has called claims that his wife charged personal expenses to a corporate account, including US$2,463 (£1,272) for handbags, $2,785 for opera tickets, and $140 for Amiel's "jogging attire" fiction and has pointed out that they were never alleged at trial. Black was ranked 238th wealthiest in Britain by the Sunday Times Rich List (2003), with an estimated wealth of £136m. Having departed the country, he was dropped from the 2004 list. Black is a former Steering Committee member of the Bilderberg Group. Served 29 months before being granted bail pending a Supreme Court ordered remand of the remaining counts which the high court vacated to the circuit of appeals for consideration of its errors, as the Supreme Court declared the statute under which Black was convicted to be, as his appeal claimed, unconstitutional. Reported to the Federal Correctional Institution, Miami on 6 September 2011 to serve an additional 7 months as a result of re-sentencing. He was released on 4 May 2012, and returned to Canada. It was conceded by the court that he had been a constructive influence in both prisons where he was detained. Initially sentenced to 6½ years imprisonment. Reduced to 42 months following appeal and re-sentencing and after the sentence had largely been served. Black was convicted on four counts in U.S. District Court in Chicago on 13 July 2007. He was sentenced to serve 6½ years in federal prison and to pay Hollinger $6.1 million, in addition to a fine of US$125,000. Appeals resulted in two of Black's three criminal fraud charges being vacated, and his conviction for obstruction of justice was upheld. Black was initially found guilty of diverting funds for personal benefit from money due to Hollinger International, and of other irregularities. The alleged embezzlement occurred when the company sold certain publishing assets. He was also found guilty of one charge of obstruction of justice. In the initial verdict, Black was fined $125,000 and sentenced to 6½ years in prison, serving a total of 37 months after two fraud charges were overturned by the 7th Circuit Court of Appeals, leaving one fraud charge and one obstruction of justice charge, and the improper receipt of $285,000, which was disclosed and approved but incompletely documented, and civil penalties from the SEC. The 6½ year sentence was reduced to 42 months. The $6.1 million fine to the SEC was reduced to $4.1 million in 2013. The Supreme Court of the United States heard an appeal of his case on 8 December 2009 and rendered a decision in June 2010. Black's application for bail was rejected by both the Supreme Court and the U.S. District Court judge who sentenced him. On 24 June 2010, the US Supreme Court ruled 8–0 with one recusal, instructing the 7th Circuit to review all four of Black's convictions including the obstruction of justice charge, finding that the definition of honest services fraud used in Judge St. Eve's (the trial judge) charge to the jury in Black's case was too broad, "unconstitutionally vague", ruling the law could apply only to cases where bribes and kickbacks had changed hands and ordered the US 7th Circuit Court of Appeals in Chicago to review three fraud convictions against Black in light of the Supreme Court's new definition. The Court reviewed Black's case and determined whether his fraud convictions stood or if there should be a new trial. The Supreme Court upheld the jailed former media baron's obstruction-of-justice conviction, for which he was serving a concurrent 6½-year sentence. Black's lawyers filed an application for bail pending the appeals court's review. Prosecutors contested Black's bail request, saying in court papers that Black's trial jury had proof that Black committed fraud. The 7th Circuit Court of Appeals granted bail on 19 July 2010 under which Black was released pending retrial on a $2 million unsecured bond put up by conservative philanthropist Roger Hertog and ordered to remain on bail in the continental United States until at least 16 August, when his bail hearing was to resume, and the date by which Black and the prosecution were ordered by the Court of Appeals to submit written arguments for that court's review of his case. Black's bail, initially, pending trial, had been $38 million. Black was to appear once again in a Chicago court on 16 August to provide full and detailed financial information to the judge, who would then consider his request to be allowed to return to Canada while on bail. Black's legal representatives, led by Miguel Estrada, advised the court they would not provide the requisite accounting and would thus not be interested in petitioning the court further on the matter. Black was under no compulsion to make this disclosure as he had initiated the appeal for a bail variation of his own volition. His next court appearance, where he might reapply for permission to return to Canada, was set for 20 September 2010. On 28 October 2010, the US 7th Circuit Court of Appeals confirmed the dismissal of two of the three vacated fraud accounts and retained one and the obstruction count. The court ruled that he must be re-sentenced. On 17 December 2010, Black lost an appeal as to fact and law on his remaining convictions for fraud and obstruction of justice. The three judge panel did not explain its reasoning. On 31 May 2011, the Supreme Court of the United States declined to hear an appeal from the circuit court's decision, also without comment. The re-sentencing on the two remaining counts by the original trial judge occurred on 24 June 2011. Black's lawyers recommended he be sentenced to the 29 months he had already served while the prosecution argued for Black to complete his original 6½ year sentence. The probation officer's report recommended a sentence of between 33 and 41 months. At the hearing, Judge St. Eve re-sentenced Black to a reduced term of 42 months and a fine of $125,000, returning him to prison on 6 September 2011 to serve the remaining seven months of his sentence, allowing for a reduction for good conduct, for which the trial judge commended him. On 30 June 2011, Black published an article for the National Review Online that provided his scathing view of the legal case, detailing it as a miscarriage of justice and an "unaccountable and often lawless prosecution". Seth Lipsky, in an opinion piece for the Wall Street Journal that ran on 28 June 2011, called the verdict against Black "head-scratching", noting that Black was found not guilty of the most serious charges brought against him. Lipsky asked why Black was denied a retrial by jury as to whether he had committed pecuniary fraud after the Supreme Court unanimously found that Judge St. Eve's instructions to the jury were "incorrect", which led to two of the three fraud counts ultimately being vacated. In the end, one fraud conviction and a count of obstruction were allowed to stand. Black's motion that the last remaining counts of conviction be vacated due to prosecutorial misconduct and his claim that he had been denied the right to have the defense counsel of his choice were denied in February 2013, along with his request for an evidentiary hearing. Black continues to maintain his innocence, and has likened the United States justice system to that of North Korea. Black has publicly stated that he is proud to have been "sent to prison for crimes I would never dream of committing, for having fought it out as well as anyone could, and for making the best I could of a bad situation. Following his release, Black wrote a column for Canada's National Post on his time in prison. Black described U.S. inmates as an "ostracized, voiceless legion of the walking dead". Black did not return to the Federal Correctional Institution in Coleman, Florida. On 6 September 2011, he was sent to a different Florida federal correction facility, this one in Miami. He was released from prison on 4 May 2012. Although he became a citizen of the United Kingdom in 2001 and became a British peer, he chose to live in his native Canada after his prison term was completed. Black, who had renounced his Canadian citizenship in 2001 as a result of Black v Chrétien, was granted a one-year temporary resident permit to live in Canada in March 2012 when he was still serving his sentence. Upon his release from prison, Black was deported to Canada. Black has been barred from entering the United States for 30 years though that could be appealed at any time. He has expressed no interest in returning to the United States. Black was appointed an Officer of the Order of Canada in 1990. In 2011, after Black returned to prison due to the failure of his appeal, Rideau Hall, the seat of the Chancellery of Honours, confirmed that the honour accorded to Black was under review by the order's Advisory Council, which has the power to recommend "the termination of a person's appointment to the Order of Canada if the person has been convicted of a criminal offence." Once the review process started, Black submitted a written application in defence of keeping his place in the Order of Canada, but failed in his efforts to persuade the Advisory Council he should appear before them to defend his case orally. Black took the matter to the Federal Court of Canada, which ruled that the council had no obligation to change its regular review process (which allows for written submissions only) simply to accommodate Black. Black attempted to appeal the court's decision without success. In an October 2012 interview, Black intimated that he would rather resign from the order than be removed: "I would not wait for giving these junior officials the evidently almost aphrodisiacal pleasure of throwing me out. I would withdraw," he told CBC's Susan Ormiston. "In fact, I wouldn't be interested in serving." The Governor General of Canada, David Johnston, announced Black's removal from the Order of Canada and his expulsion from the Queen's Privy Council for Canada in January 2014. Johnston had been recommended to do so by the Advisory Council of the Order of Canada and the Canadian Prime Minister. As a result, Black may also no longer employ the post-nominal initials OC and PC. In July 2013, the Ontario Securities Commission restarted its case against Black and two other former Hollinger executives, John Boultbee and Peter Atkinson. The regulator sought to have them banned from trading in the province's capital markets or sitting on a public board of directors. The case alleged violations of the Securities Act (Ontario). The case had been postponed pending the exhaustion of Black's appeals of his U.S. fraud convictions. The securities case alleges that Black and his two fellow directors created a scheme was to use the sale of several Hollinger newspapers in order to "divert certain proceeds from [Hollinger International] to themselves through contrived 'non-competition' payments". Black applied to have the proceedings dismissed on the grounds that he was already voluntarily refraining from being an officer or director of an Ontario corporation and undertaken to ask the approval of the OSC if he ever desired to become a director or officer of an Ontario public company. In February 2015 the OSC placed a permanent ban on Black being a director or officer of a publicly traded company in Ontario, but declined to restrict his right to trade. Black referred to the case in his column in the National Post on March 8, 2015, stating that the OSC did not come to the subject with clean hands, having "vaporized" hundreds of millions of dollars of shareholder's equity in 2005 when it blocked Black's bid to privatize Hollinger Inc., pushing that company into bankruptcy and a total loss for the shareholders. In early 2014, the Tax Court of Canada ruled that Black owed the Canadian government taxes on $5.1-million of income accrued in 2002. In mid-May 2016, it was revealed that the CRA had intervened to prevent the sale and lease-back, with a buy-back option, of Black's home on Park Lane Circle. After discussion, the sale-lease back proceeded and Black provided other assets as security pending the settlement or adjudication of the CRA claim. In 2001, British Prime Minister Tony Blair advised Queen Elizabeth II to confer on Black a life peerage with the title of Baron Black of Crossharbour. [n 2] He would sit as a Conservative peer, and his name had been put forward by the then-Conservative leader William Hague. Canadian Prime Minister Jean Chrétien advised the Queen not to appoint Black a peer, citing the Nickle Resolution of 1919 and a long history since then of objections to Canadian citizens accepting British peerages. Black at the time held both Canadian and British citizenship. Black pointed out that the Nickle Resolution referred to Canadian resident citizens, not dual citizens living in the U.K and was not binding, but when Prime Minister Blair said the Queen would prefer not to choose between the conflicting recommendations of two prime ministers of countries of which she was the monarch, Black asked that the matter be deferred. He litigated in Canada, claiming that Chrétien had no jurisdiction to create a class of citizen in another country, consisting of one person (as there were other dual citizens in the House of Lords), ineligible to receive an honour in that country for services deemed to have been rendered in that country, because of the personal objections of the Canadian Prime Minister of the day. Later in 2001, after the Ontario Superior Court and Court of Appeal had ruled that they had no jurisdiction in this area, Black renounced his Canadian citizenship, remaining a United Kingdom citizen, which allowed him to accept the peerage without further controversy. Black sat as a life peer on the Conservative benches until 2007, when he withdrew from the conservative group of peers following his conviction in the United States. He is currently a non-affiliated peer. In an interview with BBC reporter Jeremy Paxman in 2012, Black stated that he could return to the House of Lords as a voting member. Comparing himself to Nelson Mandela, Black said a criminal conviction does not prohibit him from sitting, since the House of Lords has no restriction on such a case. He has been on leave of absence from the House of Lords since June 2012. In an interview with Peter Mansbridge in May 2012, Black said he would consider applying for Canadian citizenship "within a few years", when he hoped the matter would no longer be controversial and he could "make an application like any other person who has been a temporary resident". It is not clear when or if he would be accepted, but has been a temporary for over five years with a full work permit. Duplessis: Black re-worked his 1973 Master's thesis on Maurice Duplessis into a rehabilitative biographical re-examination of the controversial long-serving Quebec premier, published in 1977. It was condensed, updated and republished in 1998 as 'Render Unto Caesar'. Franklin Delano Roosevelt, Champion of Freedom: Black completed a 1,280-page biography which was published in 2003. What Might Have Been: A 2004 essay of speculative history depicting the latter half of the 20th century as it might have unfolded had Japan not bombed Pearl Harbor in 1941, edited by Andrew Roberts. Richard M. Nixon: A Life in Full: Black's 1,152-page 2007 biography of Richard Nixon examined Nixon's career and legacy outside the immense controversy that engulfed his presidency. Rise to Greatness: The History of Canada From the Vikings to the Present (2014) Spanning 874 to 2014, and beginning from Canada's first inhabitants and the early explorers, this history challenges our perception of Canada's history and role in the world. Flight of the Eagle: A strategic history of the United States with an introductory note by Henry E. Kissinger. Examines the rise of the world's supreme power, its recent decline, and its ultimate strengths and future, and the contributions of leading figures. Backward Glances: People and Events From Inside and Out Published in 2016. A collection of Black's columns, articles, reviews and essays published in several countries over 45 years. In the November 2008 issue of Spear's magazine, Black wrote a diary piece from prison detailing "the putrification of the US justice system" and how "the bloom is off my long-notorious affection for America". On 5 March 2009, Black contributed a piece to the online version of the conservative magazine National Review (NRO). Called Roosevelt and the Revisionists and based on his earlier biography of Roosevelt, it argued that FDR's New Deal was intended to save capitalism, and deserved conservative support. In her 9 March critique of this piece on NRO, author Amity Shlaes observed, "I will be co-hosting, with Dean Thomas Cooley of NYU/Stern, a Second Look conference on March 30 to permit scholars to present the multiple studies that suggest the New Deal and Great Depression are worth taking a look at from every angle. The great shame here is that Conrad would have added much to this event, and yet he cannot attend." A Matter of Principle: Published in 2011, Black described his indictment and the trial, the subsequent conviction, imprisonment and the appeal. Woven throughout the book, Black did not hide his contempt toward the prosecutors, and the people and media who he perceived betrayed him and harbored bias against him. Black reserved the most indignation toward the prosecutors who he believed mounted a campaign to destroy him. The book also discussed his views on politics, corporate governance, and the U.S. justice system and its need of reform. In a rebuttal, to A Matter of Principle, Black's defence lawyer, Edward Greenspan said "Conrad's flawed account of his own trial is a reminder of how seldom an accused person actually grasps what is going on in court". In particular, Greenspan vigorously rebuked Black's repeating the allegation of "extortion" described in an article written by Mark Steyn for Maclean's. Canadian artist George Walker published the wordless novel The Life and Times of Conrad Black in 2013. ^ Prior to being granted bail, his scheduled release date was 30 October 2013. ^ With, not part of the main title, the territorial designation, of Crossharbour in the London Borough of Tower Hamlets. This entitles him to the standard official style of "Lord Black". ^ a b "Lord Black of Crossharbour profile". Parliament of the United Kingdom. Retrieved 3 April 2016. ^ Financial Post: "Conrad Black moves to end Hollinger CCAA"
^ a b c Clark, Andrew: "At some level, he's still asking the same question as he was when he was seven or eight – who am I? ", The Guardian, 16 March 2007. ^ a b c d e f g Black, C. (1993). A Life in Progress. Key Porter Books; ISBN 1-55013-520-1. ^ "Remembering my older brother Mario Monte", National Post, 22 October 2011. Retrieved 11 June 2018. ^ "Mount Pleasant Group". www.mountpleasantgroup.com. ^ "George Jonas Biography". georgejonas.ca. George Jonas.ca. Archived from the original on 6 October 2015. Retrieved 5 October 2015. ^ "Headline Maker". TIME. Retrieved 5 May 2016. ^ a b "Conrad Black: Timeline". CBC News. 23 June 2009. Retrieved 11 June 2018. ^ a b Newman, P. (1983). The Establishment Man. Seal Books; ISBN 0-7704-1839-2. ^ "The Peerage". The Peerage. Retrieved 29 March 2016. ^ "Nineteen years with my perfect Valentine" Archived 29 January 2013 at Archive.today, National Post, 12 February 2011. ^ "How I woke up from spiritual slumber and inched at a snail's pace to Rome", The Catholic Herald, 11 September 2009. Retrieved 11 June 2018. ^ "A dear, wise, constant friend", Catholic Education Resource Centre, 12 April 2003. Retrieved 11 June 2018. ^ a b "Conrad Black: I have found serenity through Catholicism in jail", The Daily Telegraph. 10 September 2009. ^ a b c Black, C. (2011). A Matter of Principle. McCelland & Stewart; ISBN 978-0-7710-1670-7. ^ a b c Francis, D. (1986). Controlling Interest – Who Owns Canada. Macmillan of Canada; ISBN 0-7715-9744-4. ^ "Innovation: CIBC Annual Report 1999" (PDF). Cibc.com. Retrieved 5 May 2016. ^ a b Olive, David "A Conrad Black timeline", Toronto Star, 11 March 2007; retrieved 9 June 2008. ^ "Gale Directory of Company Histories: M. A. Hanna Company". ...in 1981, Canadian financier Conrad Black of Norcen Energy Resources, Ltd., initiated a year-long takeover battle. Black's purchase of a large block of Hanna stock in October 1981 quickly captured the attention of Hanna chairman Robert F. Anderson and other members of the board. After a relatively brief, but heated federal hearing, Black and Hanna made a standstill agreement that gave Black 20 percent of Hanna in exchange for $90 million. Black became a director, and the last descendant of an M. A. Hanna & Company partner, George M. Humphrey II, resigned from his position as senior vice president by 1984. ^ "Canadian Labour Congress: Dominion Food Stores". Adjustment.ca. Retrieved 18 June 2010. ^ Gessell, Paul "Saul's Ottawa 'Truths'" Archived 12 October 2008 at the Wayback Machine, The Ottawa Citizen, 18 September 2008. ^ "Conrad Black, a cheese-eating Labrador and countless vituperative flights of fancy", National Post, 24 June 2010. ^ BBC News "Conrad Black: Where did it all go wrong", bbc.co.uk, 27 February 2004. ^ Jason Kirby; John Intini. "The Black Trial: The deal breakers". Maclean's. Archived from the original on 13 August 2013. ^ a b c Stein, Adrian and Olga. "Auto da fe". ^ "David Radler begins prison sentence" – via The Globe and Mail. ^ "Black to receive 'substantial' libel settlement". ^ "Corporate Scandals: Black shadows", The Economist, 15 March 2007. ^ "Conrad Black defence costs top $100 million". 22 November 2007. ^ a b "Auto Da Fé: Conrad Black, Corporate Governance, and the End of Economic Man", Books in Canada, December 2006. ^ "Conrad Black to host talkshow on Canadian TV". London: The Telegraph. 29 January 2013. Retrieved 30 January 2013. ^ "Conrad Black begins his foray as a TV talk show host". Toronto Star. 4 October 2013. Retrieved 9 January 2016. ^ "theZoomer: Television For Boomers With Zip! Conversations With Conrad premieres with Boris Johnson". Thezoomertv.com. Retrieved 3 April 2016. ^ United States Department of Justice. "Press Release" Archived 28 May 2008 at the Wayback Machine, usdoj.gov, 15 December 2005. ^ Timmons, Heather: "Conrad Black sells London townhouse", International Herald Tribune, 20 May 2005. ^ "Conrad Black charged with 8 counts of fraud". CBC News. 17 November 2005. Retrieved 11 June 2018. ^ Taekema, Dan (22 March 2016). "Conrad Black's mansion sells for bargain price — relatively". thestar.com. The Toronto Star. Retrieved 9 October 2016. ^ Takema, Dan (15 March 2016). "Conrad Black sells mansion, stays put". thestar.com. The Toronto Star. Retrieved 9 October 2016. ^ Hosking, Patrick; Wighton, David. "The Sunday Times Rich List 2003". The Times. Retrieved 18 June 2010. ^ Hosking, Patrick; Wighton, David. "The Sunday Times Rich List 2004". The Times. Retrieved 18 June 2010. ^ "Former Steering Committee Members". Bilderberg Meetings. Archived from the original on 2 February 2014. Retrieved 3 April 2016. ^ "Conrad Black gets bail, review of case". Ctv.ca. Archived from the original on 20 October 2011. Retrieved 3 April 2016. ^ "Conrad Black to report back to prison in September", Globe and Mail, 11 July 2011; accessed 3 April 2016. ^ a b "Black sent back to jail for 13 months", Globe and Mail, 24 June 2011. ^ Alamenciak, Tim (29 April 2012). "Conrad Black set to be released from prison this week". Toronto Star. Retrieved 1 May 2012. ^ "Conrad Black convicted of fraud", bbc.co.uk, 13 July 2007. ^ Ameet Sachdev "Appeals court upholds Conrad Black's conviction on fraud, obstruction charges but guilty verdicts on two other fraud counts are vacated", Chicago Tribune, 29 October 2010. ^ "Conrad Black fined and banned by US", bbc.com, 16 August 2013; accessed 3 April 2016. ^ McQuillen, William. "Conrad Black: Conviction Questioned by High Court", Bloomberg.com, 8 December 2009. ^ "Conrad Black denied bail", Toronto Star, 15 July 2009. ^ Alberts, Sheldon. "Court sets aside appeals court ruling in Conrad Black case". www.nationalpost.com. ^ a b "Conrad Black seeks bail", Globe and Mail, 7 July 2010. ^ "Top stories from Canada and around the world". News.ca.msn.com. Retrieved 3 April 2016. ^ "Conrad Black sued for $71 million in back taxes", Toronto Star, 15 July 2010. ^ a b c "Black to be released but can't come to Canada", Toronto Star, 21 July 2010. ^ "Conrad Black granted bail", Toronto Star, 19 July 2010. ^ "Court clears Black for release" Archived 14 September 2010 at the Wayback Machine, Globe and Mail, 22 July 2010. ^ "Black can't return to Canada yet", Globe and Mail, 23 July 2010. ^ "Court to hear Conrad Black case Aug. 16", Vancouver Sun, 26 July 2010. ^ "Conrad Black likely stuck in the U.S.", ctv.ca, 27 July 2010. ^ ""Black 'enlightened' by prison time", ca.msn.com, accessed 3 April 2016. ^ Conrad Black drops bid to return to Canada – Need to know, Macleans.ca; 6 August 2010; accessed 26 March 2016. ^ "UNITED STATES OF AMERICA, Plaintiff-Appellee, v. CONRAD M. BLACK, PETER Y. ATKINSON, JOHN A. BOULTBEE, and MARK S. KIPNIS" (PDF). Financialpostbusiness.files.wordpress.com. Retrieved 3 April 2016. ^ "U.S. Supreme Court rejects Conrad Black's appeal" Archived 4 June 2011 at the Wayback Machine, Globe and Mail, 31 May 2011. ^ "Conrad Black sentencing set for June 24", Chicago Sun-Times, 13 January 2011. ^ "Will Conrad Black go back to jail? ", Globe and Mail, 23 June 2011. ^ "Conrad Black to report back to prison in September Archived 15 July 2011 at the Wayback Machine", Globe and Mail, 11 July 2011. ^ Conrad Black, "I stand before the court", NationalReview.com, 30 June 2011. ^ Seth Lipsky, "A head-scratching verdict against Conrad Black", The Wall Street Journal, 28 June 2011. ^ "Conrad Black loses bid to void guilty verdict". Toronto Star. 20 February 2013. Retrieved 20 February 2013. ^ "Conrad Black lashes out in feisty interview". Ctvnews.ca. Retrieved 3 April 2016. 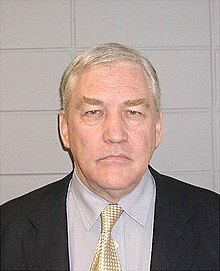 ^ a b Conrad Black profile, Federal Bureau of Prisons; retrieved 6 January 2010. ^ Agence France-Presse (26 January 2009). "Eight injured in riot at Conrad Black's Prison". Canada.com. Archived from the original on 23 May 2009. Retrieved 18 June 2010. ^ Joyce, Julian. "Black times ahead for fallen peer", bbc.co.uk, 4 March 2008; retrieved 6 January 2010. ^ "Conrad Black: My prison education". Fullcomment.nationalpost.com. Archived from the original on 8 July 2012. Retrieved 3 April 2016. ^ Kwan, Amanda (2 September 2011). "Black won't return to Florida prison". Toronto Star. Retrieved 15 September 2011. ^ D'Aliesio, Renata (4 May 2012). "Conrad Black released from Florida prison". Toronto: The Globe and Mail. Archived from the original on 7 May 2012. Retrieved 4 May 2012. ^ Chase, Steven (2 May 2012). "Just how special is Lord Black's residency permit?". Toronto: The Globe and Mail. Retrieved 4 May 2012. ^ Staff (4 May 2012). "Conrad Black returns to Toronto after serving jail time in U.S." National Post. Retrieved 4 May 2012. ^ Waldie, Paul (25 October 2012). "Securities violations cost Conrad Black $6.1-million". Globe and Mail. Toronto. Retrieved 25 October 2012. ^ Campion-Smith, Bruce (14 September 2011). "Conrad Black could be stripped of Order of Canada". Toronto Star. Retrieved 15 September 2011. ^ "Conrad Black loses Order of Canada hearing bid -- federal court won't interfere". The Star. Toronto, ON. 25 October 2012. ^ Jones, Allison (2 November 2012). "Conrad Black keeps fighting to make personal plea to keep Order of Canada". Toronto Star. Retrieved 2 November 2012. ^ Pagliaro, Jennifer (26 October 2012). "Conrad Black will resign Order of Canada rather than have it terminated". Toronto Star. Retrieved 26 October 2012. ^ "Termination of Appointment to the Order of Canada". Retrieved 31 January 2014. ^ "Conrad Black stripped of Order of Canada". CBC News. 31 January 2014. Retrieved 31 January 2014. ^ "Conrad Black stripped of the Order of Canada". Globe and Mail. Toronto. 31 January 2014. Retrieved 1 February 2014. ^ "Conrad Black: Of that OSC ruling..." 7 March 2015. ^ "OSC slaps permanent ban on Conrad Black". Thestar.com. Retrieved 3 April 2016. ^ "Conrad Black owes $5.1-million in back taxes, court rules". Globe and Mail. Toronto. 21 January 2013. Retrieved 21 January 2013. ^ "Conrad Black's Toronto mansion sells for $14-million". 30 June 2016. ^ "No. 56379". The London Gazette. 5 November 2001. p. 12995. ^ "Conrad Black to renounce Canadian citizenship". ^ Tu Thanh Ha. "Conrad Black says he could still sit in the U.K. House of Lords". The Globe and Mail. Retrieved 3 April 2016. ^ "Conrad Black stripped of two honours by his native Canada". The Guardian. 1 February 2014. Retrieved 1 February 2014. ^ Janeway, Michael (21 December 2003). "The Lord of Springwood". The New York Times. ^ "Books Briefly Noted". The New Yorker. 7 January 2009. Retrieved 18 June 2010. ^ Black, Conrad. "Jail Diary" Archived 19 December 2008 at the Wayback Machine, Spear's, November 2008. ^ Black, Conrad (2011). A Matter of Principle. Toronto, Ontario: McClelland & Stewart. ISBN 978-0-7710-1670-7. ^ Johnson, Paul. "Apologia pro vita sua", The Spectator, 17 November 2012. ^ Bell, Douglas (16 September 2011). "Conrad Black comes out zinging". Toronto: The Globe and Mail. Retrieved 23 February 2012. ^ Steyn, Mark (30 July 2007). "The Black Trial: The human drama the jury didn't see". Maclean's. Archived from the original on 3 April 2012. Retrieved 24 January 2012. ^ ""Citizen Black": An entertaining documentary". Post-gazette.com. 17 February 2006. Retrieved 18 June 2010. ^ Wisniewski, Mary (23 November 2006). "Prosecutors to see 'Citizen Black' footage". Chicago Sun-Times. Archived from the original on 10 March 2008. Retrieved 18 June 2010. "Conrad Black collected news and commentary". The Guardian. "Conrad Black collected news and commentary". The New York Times. SEC – Breeden Report Complete 512-page copy of the Report of Investigation by the Special Committee of the board of directors of Hollinger International Inc.